Last Wednesday Io Harberts called me, she wanted to know if I could paddle with her today at 0700 am. She had to be some where else mid morning. I told her I would be at the Rum River landing at 7 am. I’ve paddled with Io a few times in the past, but we usually don’t get to paddle together since we both usually paddle the stern. The only request I had of Io today was that we take it easy since tomorrow is the Flag Race and I had put in a good, hard 3 ½ hour paddle yesterday. She was fine with it. It felt good to be in the bow. Io gave me a compliment today about me being in the bow. 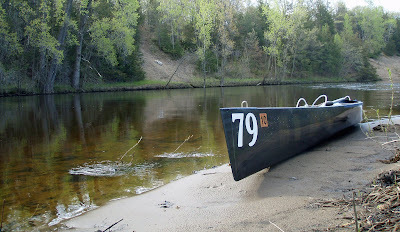 Since I paddle the stern I know where Io will want to go with the canoe so I will lean the canoe to go around any obstructions, switch to paddling on the same sides as her, instead of me doing any draw strokes and this keeps Io from having to do any correction strokes. I’m a better bow person, but I like the stern and being 148 pounds that’s where I need to be most of the time. Today was a quiet day on the river. 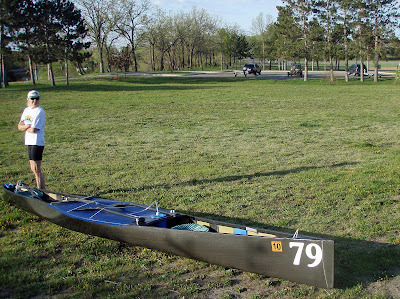 We saw a kayak and a canoe before we saw Steve Yurista in his C-1 about 5 minutes from the put-in. Then we saw Steve Peterson and Natasha just getting on the water. 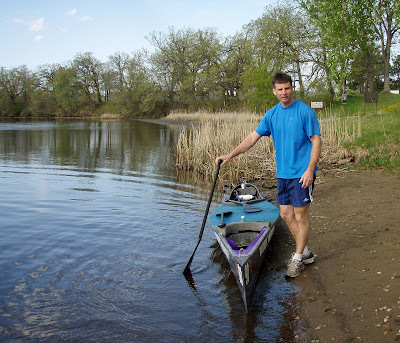 Jason Larsen was just about to get in his canoe and he was going to paddle with Julie Boehrer. The water level on the Rum River has dropped about two feet in the last two weeks.